The Lagos State Police Command said it had arrested two policemen who allegedly assaulted a lawyer, Olakunle Kareem. The state Police PRO, CSP Chike Oti, said the Divisional Police Officer in charge of the Lion Building division had also been queried over the incident. Kareem and his boss, Oluyemi Olawore, a senior lawyer and managing partner at Olawore & Co., had a disagreement at the chamber on McCarthy Street, Lagos Island. Olawore was said to have invited the policemen from the Lion Building Police Division, accusing Kareem of attacking and holding him hostage. A video of the incident, which went viral on the Internet on Wednesday, showed moments the two officers slapped Kareem several times on the face. The victim, who asked the policemen to listen to him, denied holding his boss hostage, as one of the officers held him by the neck and threatened to shoot him in the leg. The Lagos police spokesperson, Oti, in a statement on Thursday, said the policemen had been arrested for unprofessional conduct. 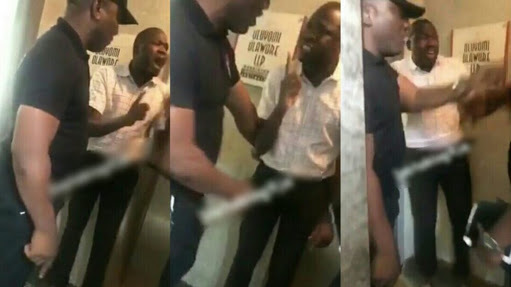 He said, “A video of police officers assaulting a young lawyer said to be demanding his salary caught the attention of the Commissioner of Police, Lagos State, Edgal Imohimi, who constituted an investigation panel to look into the allegation. “Findings revealed that officers in the video are not SARS operatives as alleged, but conventional policemen attached to the Lion Building Police Station, who were invited to the chamber of Olawore & Co. of 28/30, McCarty Street, Lagos Island, by the managing partner, Oluyomi Olawore. “The said Oluyomi Olawore sent a distress call to the police through one of his junior partners, requesting that he be rescued from another junior partner by name, Olakunle Kareem, whom he alleged was about to use an unlawful force on him having disconnected the firms’ CCTV cameras and locked up all doors leading into the firm and by so doing, held Olawore hostage inside his office. “It was based on the complaint that the DPO in charge of Lion Building dispatched policemen to the chamber to bring the feuding lawyers over for interrogation. However, the Commissioner of Police observed with dismay that the policemen sent to the scene were not at their professional best. Oti said the State Criminal Investigation and Intelligence Department, Yaba, had been directed to take over investigation into the case. Meanwhile, the Nigerian Bar Association Chairman, Lagos chapter, Chukwuka Ikwuazom, has condemned the conduct of the officers. In a statement on Thursday, Ikwuazom said, “The DPO… pleaded that we should not escalate the matter to the leadership of the police. He added that the association would forward a petition to the state Commissioner of Police demanding investigation into the incident.